Tripura police seized huge quantity of cannabis from Gandhi Gram area on the outskirt of Agartala town on Saturday morning. The value of the seized contraband is estimated at Rs 14 lakh. Acting on specific information, police conducted raid on a truck parked inside a garage at Gandhi Gram and seized 26 packets of ganjas. Each packet of ganjas weighs 15 kg. The owners of the truck and garage have been detained. SDPO NCC along with other officers conducted the raid. Later the ceased truck along with the illegal consignment was brought to Narshingharh police station. SP Ajit Pratap Singh told Northeast Now that the detained persons were being interrogated by the police. Police are trying to know from where they have got the consignments of 26 packets of ganjas and also the destination of the consignment. Recently the Tripura police along with the BSF recovered large quantities of drugs and contraband including Yaba tablets, heroine, brown sugar and opium besides several cases of liquors in and around Agartala. 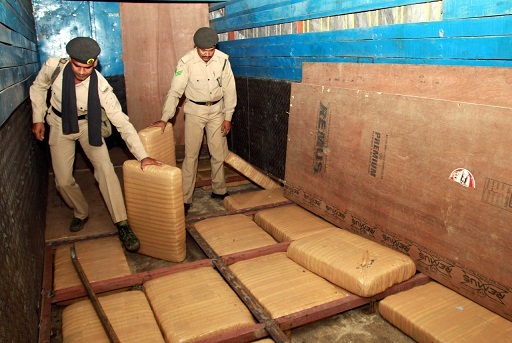 Thought earlier it was believed that Tripura is the transit point for smuggling contraband to the neighbouring states and country but the recent recoveries proved a section of the youths in the state have fallen prey to drug addiction.